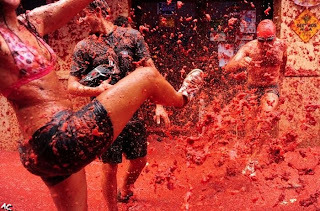 In Bunol, Spain, people pelt each other with tomatoes during a festival called Tomatina (inset). Chinese grandmothers and mothers would probably see red in this. As a child, I remember Mother reminding the children to finish their food so that there is not a grain of rice left on the plate. Finish your rice or Lei Gong will get you! Lei Gong (雷公) is the Thunder God in Chinese mythology. Chinese children are traditionally taught that if a person waste his food, thunder will strike him. It does not have to work that way, don't you think? 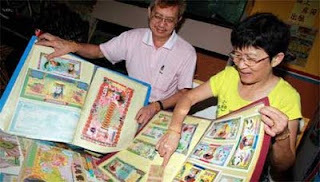 Historians often talk about the Four Greatest Mysteries of the Qing Dynasty, and here I am tempted to introduce the Four Greatest Gems of Chinese Cuisine - the char siew, siew yok, lap cheong and bakkwa, all pork dishes that could go fine with rice or would taste just yummy on its own. 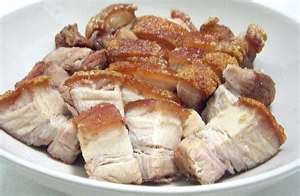 Char siu is meat, usually pork, seasoned with a mixture of honey, five-spice powder, fermented tofu, dark soy sauce, hoisin sauce and barbequed unlike siew yok which is roasted. Lap Cheong is a Chinese sausage and I personally feel that it goes better with rice than with bread. Of the four, bakkwa, the flat thin sheets of salty-sweet dry meat said to resemble jerky is best taken on its own and it is no wonder that is a popular snack among Chinese in Macau, Malaysia, Singapore, Taiwan and even in the Riau Islands and the Philipines.Now, which is char siew, siew yok, lap cheong and bakkwa?